Carlos Gracie Sr. passed away 20 years ago on this date of Oct 7 in 1994. He was the co-creator of Gracie Jiu-jitsu along with his brother Helio Gracie (although there is some contention as to who really created Gracie Jiu-jitsu), as well the creator of The Gracie Diet. 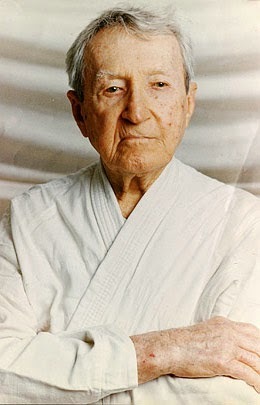 This post will serve as a "In Memory of ..." as well as "The Wisdom of ..."
12 Commandments of Jiu-jitsu by Carlos Gracie Sr.
Be so strong that nothing can disturb the peace of your mind. Talk to all people about happiness, health, and prosperity. Give to all your friends the feeling of being valued. Look at things by the enlightened point of view and update your optimism on reality. Think only about the best, work only for the best, and always expect the best. Be as just and enthusiastic about others victories as you are with yours. Forget about past mistakes and focus your energy on the victories of tomorrow. Always make those around you happy and keep a smile to all people who talk to you. Apply the largest amount of your time on self-improvement and no time in criticizing others. Be big enough so you can feel unsatisfied, be noble enough so you can feel anger, be strong enough so you can feel fear, and be happy enough so you can feel frustrations. Hold a good opinion about your self and communicate that to the world, but not through dissonant words but through good works. Believe strongly that the world is in your side, as long as you stay loyal to the best of yourself. These 12 Commandments were not meant for just Sport but as a Way of Life. Please check The Wisdom Of ... for other greats' Wisdom they passed onto us.